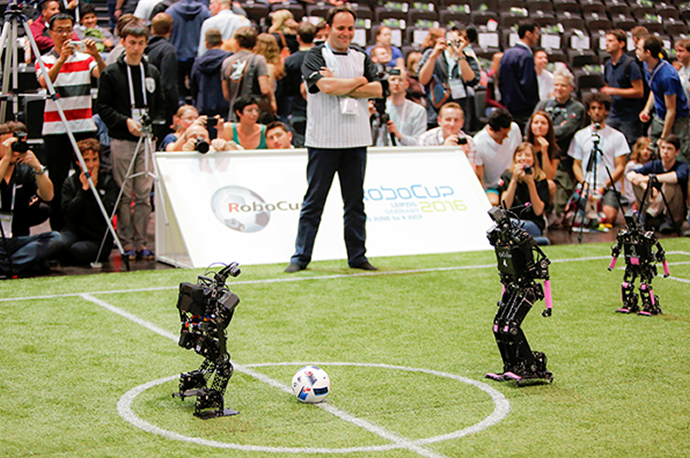 RoboCupSoccer is a soccer game played by robots, which commenced to promote the research and development of robot and AI technologies through friendly competition. While some other robots are radio- or remote-controlled, in this game, the robots have to think for themselves and autonomously make decisions to act. RoboCupSoccer has eight leagues according to the robot size and form: Small Size, Middle Size, Humanoid (KidSize/TeenSize/AdultSize), Standard Platform, and Simulation (3D/2D). The Robot Soccer leagues have established rules for each game, covering different field (pitch) sizes and numbers of robots. 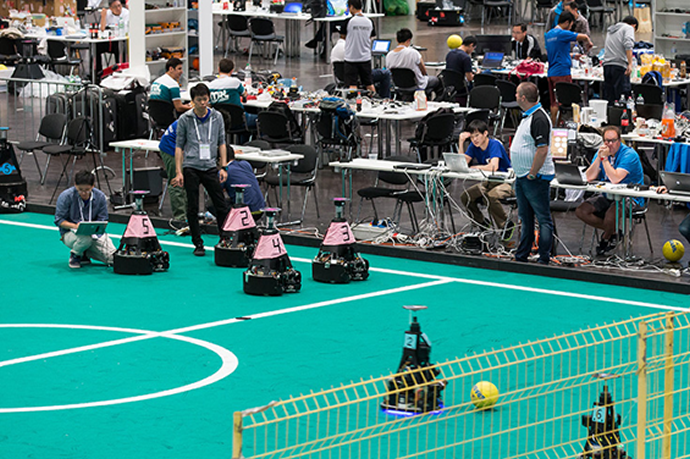 Some of these leagues of multiple autonomous robots playing soccer demonstrate strategic plays based on the mapping of the surrounding robots. The rules are amended at appropriate times due, for instance, to technological advance. 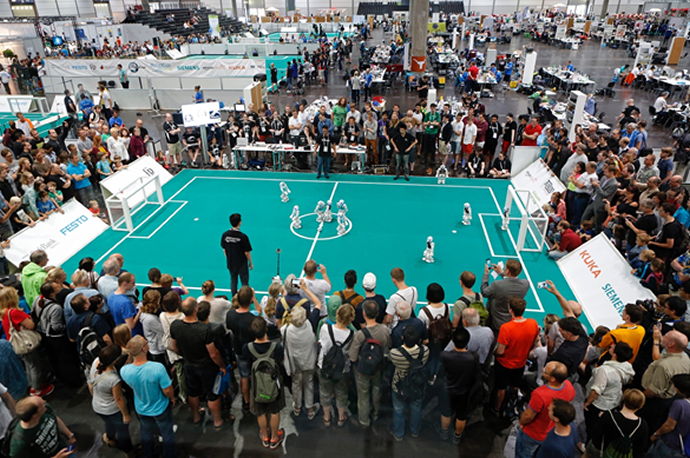 A Small Size League game is played between two teams of six robots each. 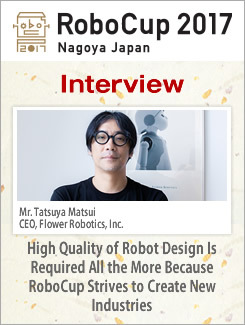 The robots must be no larger than 18 cm in diameter and no higher than 15 cm. The playing field is a green carpet, 9 m long and 6 m wide. The game uses an orange golf ball. 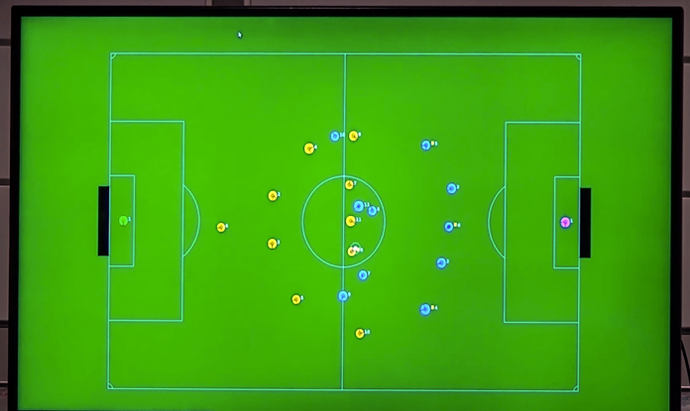 Information provided by a vision system incorporating four cameras installed above the field and judgments made by the referee are sent to the two competing teams. Using these sets of information, the robots communicate with one another via a wireless system so as to play the game autonomously and strategically. Speedy movements and collaborative plays are the most attractive points of the Small Size League. This league is recommended for fans of human soccer games. 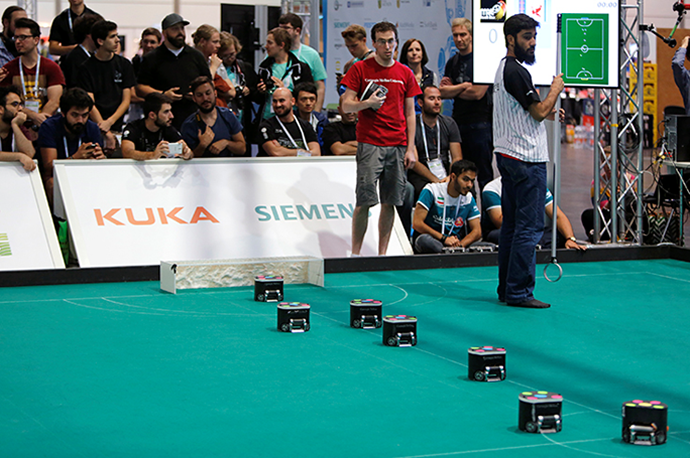 Two teams of five autonomous robots each, within a 52 cm square in length and width and no higher than 80 cm, compete in soccer games. The playing field is a green carpet, a maximum of 12 m by 18 m. A Middle Size League game uses the same size 5 ball as is used in human soccer games, whose color is specified before the competition. Sensors, including cameras, and computers used for movements are mounted on each robot. The robots play the game strategically, sharing positional information with the other robots. Powerful movements are the most attractive feature of the Middle Size League. The Humanoid League has three sub-leagues according to the robot size. Each sub-league employs robots walking on two legs. One challenge for them is to move and kick the ball accurately. Robots cannot move as nimbly as humans. However, their abilities to maintain balance while walking and kicking, and to recognize surrounding robots and the field, as well as the team strategies and other technical features, are improving year by year. The Humanoid League is expected to make a substantial contribution to the evolution of important technologies for the future development of humanoids. 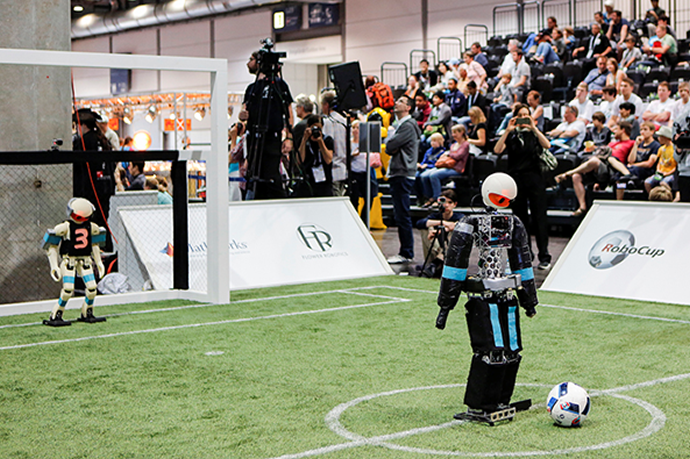 The Standard Platform League holds soccer games using only the same model of robot, the NAO communication robot (approximately 58 cm tall) from SoftBank Robotics (each team comprising five robots). Each team participates in the game under almost uniform hardware conditions. The NAO communication robot’s movements are rather limited, as it is not specifically designed to play soccer. The robots communicate with each other, with each one playing the game making autonomous decisions. 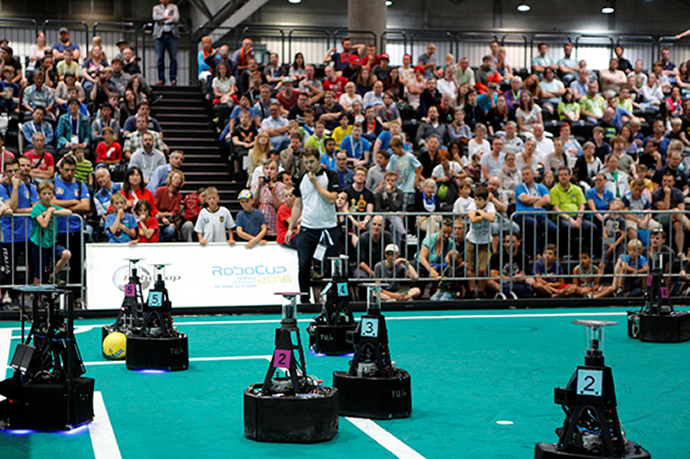 The spectators enjoy many aspects of the match, letting out a cheer simply at a successful pass and smiling at cute robots taking a tumble when some distance away from the ball. 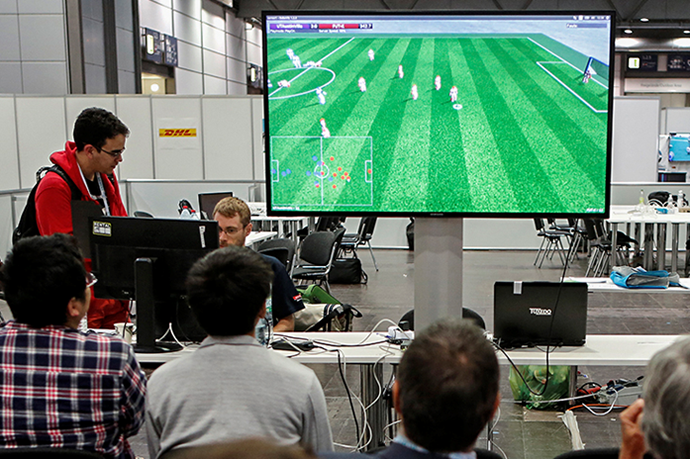 The Simulation League uses a video display to run soccer games without the use of real robots. It resembles a video game. 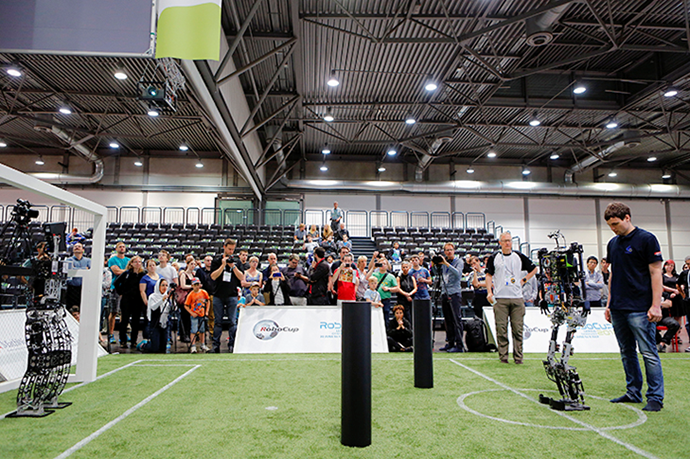 The match is played between autonomous systems rather than human players. Simulation League competitions are therefore sometimes called matches pitting AI against AI. The game is performed on a server called a SoccerServer. Eleven players compete against eleven players. Using virtual sensors, each player receives inputs of data such as its surrounding situation and the position of the ball in order to act. The sub-leagues in the Simulation League are 3D and 2D. 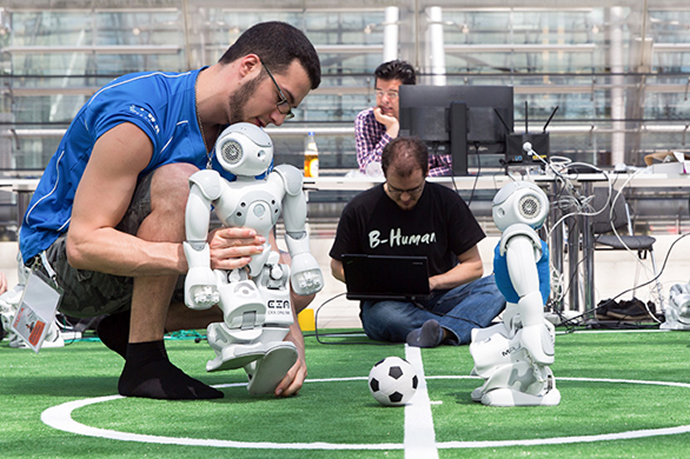 The players in the Soccer 3D Simulation League are modeled on the NAO from SoftBank Robotics. The Soccer 2D Simulation League is one of the oldest in RoboCupSoccer. 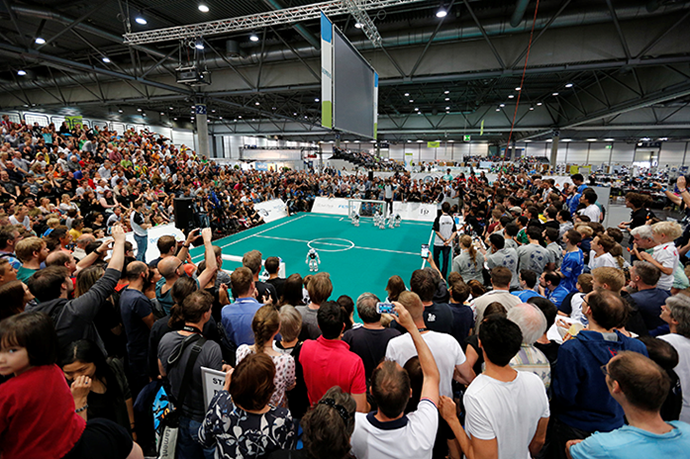 The speedy soccer games competed by autonomous AI systems using sophisticated strategies are a must-see.